Being a bit of a travel nerd and travel stylist, I am always reading the latest travel publications and blogs to get the hottest and latest info for my clients. I make sure I talk to my suppliers so that I can work out where the NEXT big travel destination is likely to be. Instagram is another favourite tool for staying on top of #trending destinations, where I follow countless travel bloggers, photographers, hotel & resort brands etc…. I love to be inspired and see the world through their eyes, and I like to keep my finger on the pulse. Towards the end of 2014 Iceland seemed to be just about everywhere (and as a destination it’s now shifted to the very TOP of my to do list), but recently I’ve seen a huge trend towards Oman with many of my own clients requesting info on the destination, and many of the people that I look to for inspiration heading there themselves. While it’s not a ‘new’ destination by any means, Oman is yet to be touched by the mega development of its Arabian neighbours and manages to still hold its authentic charm, but it seems travellers are catching on! So, since most Aussies probably couldn’t pinpoint it on a map, I thought I’d show you some of the highlights of this Arabian paradise, and perhaps inspire you to venture a little further into the peninsula on your next trip to or through the Middle East! 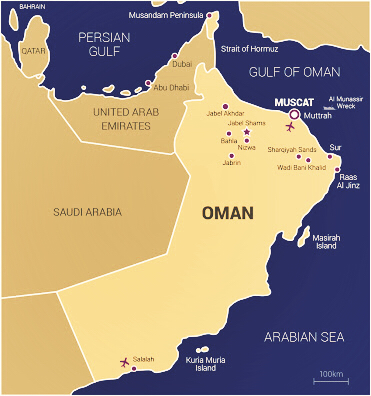 Oman is located on the South East coast of the Arabian Peninsula, with its neighbour of the United Arab Emirates (Dubai/Abu Dhabi) becoming tourist hot spots in recent years. While most Australian’s wouldn’t think of Oman as a travel destination in its own right, I’ve seen it become more and more requested as an add on to a stay in Dubai or as an alternative transit destination for Aussies moving through the Middle East to Europe. What are the top experiences in Oman? The heart and gateway to Oman, Muscat is the capital and is rich with history and culture. A couple of days to explore its Grand Mosque, Royal Opera House and Mutrah Souq (Oman’s oldest market, where you could spend hours getting lost amongst the clothes, food and traditional Arabian treasures) are a must, before setting off to one of Oman’s picturesque beaches or Desert experiences. 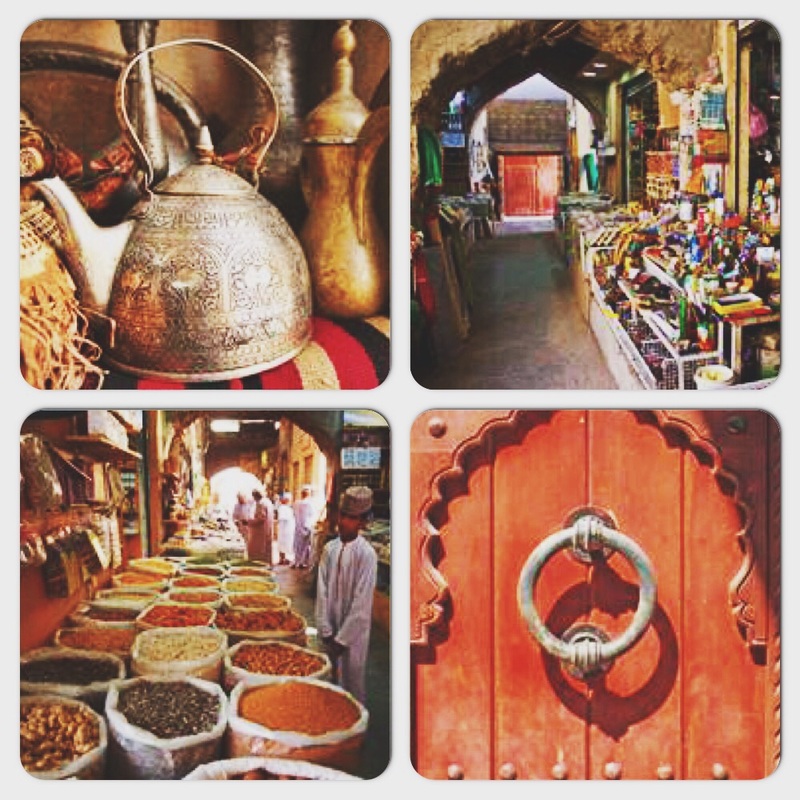 Speaking of Souq’s, if it’s a traditional Arabian market you’re after, then the BEST can be found in Nizwa. Now Oman’s second biggest tourist town, Nizwa is also renowned for its Fort. A Desert region of Oman which is a destination in it’s own right and what is a visit to the middle east without the perfect desert experience? With spectacular desert sunsets and a night under the stars, a stay at Desert Nights Camp is a must! As the only luxury camp in Oman it’s the perfect base for an Arabian adventure. You’ll find Bedouin style tents and the flickering glow of camp fire. Excursions for the young and young at heart including camel riding, dune bashing, bike riding and much much more, a stay in this luxury desert abode is truly a unique and worthwhile experience. This is the highest mountain range in the eastern Arabian peninsula, and the views and activities amongst them are definitely worth the drive (which is still only 2.5hrs from Muscat or under an hour from Nizwa). To explore, where better to do it from that the stunning Alila Jabal Akhdar. Alila Resorts know how to do luxury (think of Alila Uluwau, the hot spot for most Aussies looking for a luxe villa stay in Bali), and their Oman property is absolute perfection! Alila offers you the perfect opportunity to immerse yourself and indulge in the many experiences on offer, all whilst enjoying their renowned service and comfort. From trekking, canyon walks, cave exploration and other outdoor pursuits, to discovering the cultural and culinary traditions, connecting with the environment and community, or pampering yourself with the various wellness programs, embark on bespoke experiences for a truly memorable holiday. Whilst we are extremely spoilt for beaches here in Australia, Oman has some pretty wonderful beaches of their own that are definitely worth checking out, with some of the world’s top hotel groups securing prime real estate, including Six Senses, Shangri La, The Chedi, Intercontinental and many more. Ras al Hadd where it’s said that you’ll see the 1st sunrise of the Arabian Peninsula, and also home to Turtle watching in Oman, where annually thousands of Sea Turtles migrate to lay their eggs. Al Sawadi Beach is perfect if you’re looking for a diving or snorkeling destination in Oman, with various dive sites located within the area in Oman’s only Marine nature reserve. Mughsayl Beach, Salalah was voted recently as one of the world’s top 10 beaches on travel.com and it’s unique landscape is said to have something to do with this. It’s not just your average sandy beach. Here you’ll find collapsed caves that have created impressive blow holes and coconut groves and banana plantations dotting the coast line, growing right to the water’s edge. Zighy Bay is a remote getaway, nestled between dramatic mountains on one side and a sandy beach on the other, and Six Senses Zighy Bay have created a destination that offers you a hideaway that is like something from a James Bond Film. Arrive by helicopter or 4 wheel drive, and take up some of the many experiences on offer including diving, snorkelling, hiking, mountain biking, 4wd’ing, cooking classes, sunset cruises, wellness packages and more. So, the list goes on and on with what there is to see and do in Oman, but I’m not going to attempt to re-write your favourite travel guide. These are just some of the destinations and experiences that would draw you to Oman, so I thought I’d share them with you, but there are many many more. Have you been to Oman? Do you know people who have? I’d love to hear your thoughts, and any insider tips that you could offer up. If you’re thinking of an Arabian getaway, then perhaps Oman is the destination for you, or it may just be the perfect side trip on your next trip to Asia or Europe. Thanks as always for reading, and may I continue to inspire your lust for travel! ← The Atlantic Byron Bay – Beach house bliss in the heart of Byron. I visited Oman last year as my boyfriend was working out there as an English teacher. It was my first time to the Middle East and I loved it. It’s full of culture and gorgeous landscape. I would recommend people to visit for sure! Thanks for checking out my post! I love that you’ve already been and yes the Middle East in general has a wonderful culture and landscape doesn’t it! I can’t wait to get to Oman myself, but hopefully I’ve inspired others. Happy Travels!